You’ll see these parts described as variations on “4×4 Matrix 16 Keypad Keyboard Module 16 Button” on ebay. 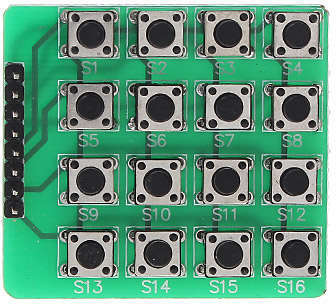 They’re very simple: if you press a button (say S7), the row pins (R1-4; R2 for S7) and the column pins (C1-C4; C3 for S7) are connected. So pins R2 and C3 are connected when S7 is pressed. 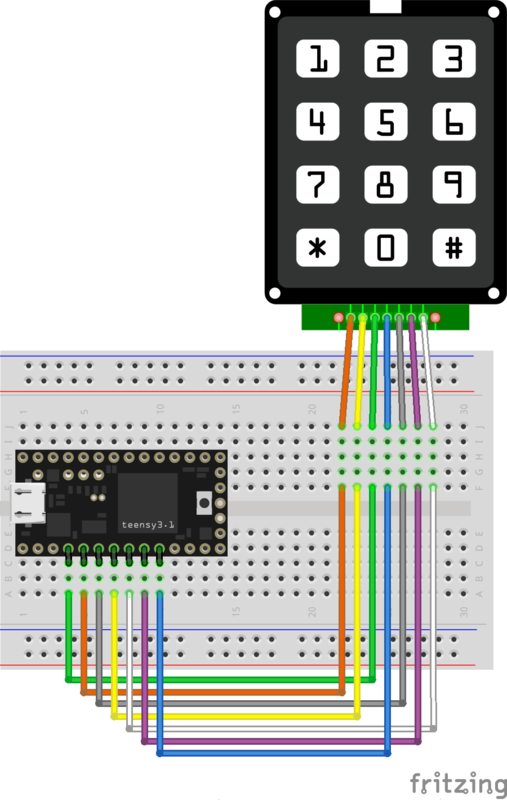 You can use the Arduino Keypad library to talk to these, but do remember they use up 8 I/O pins. 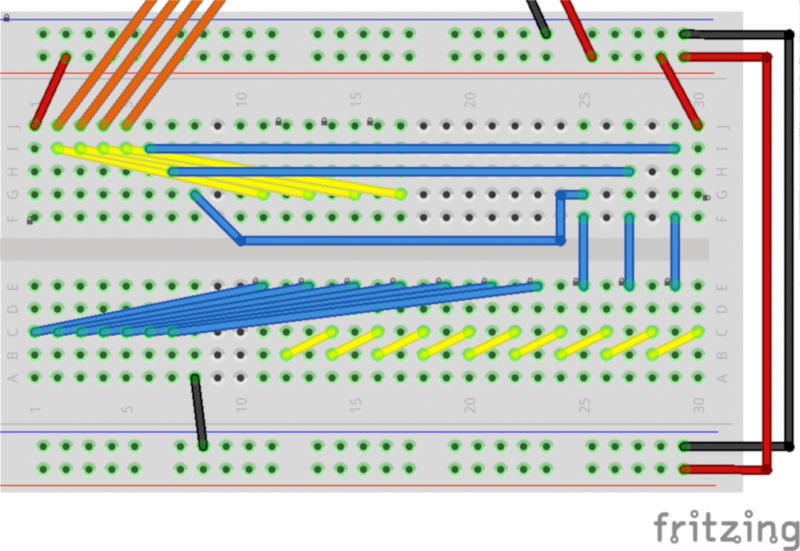 It’s not internally routed in Fritzing, and you likely won’t be able to use it for any kind of schematic work, but who uses Fritzing for anything other than pretty pictures? I’ve had a couple of Teensy boards for a while, but a misunderstanding that they needed a load of of extra software installed (they need one thing, and it’s easy) had kept me away. They’ve got really impressive specs, and they’re especially easy to turn into USB devices like keyboards. 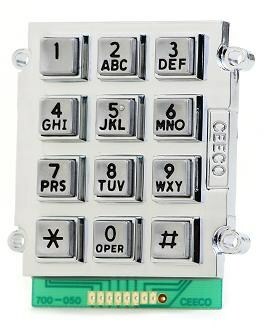 Here’s a little demo that turns a phone keypad — in my case, a ridiculously solid CEECO solid metal keypad designed for institutional use — into a simple USB keyboard. 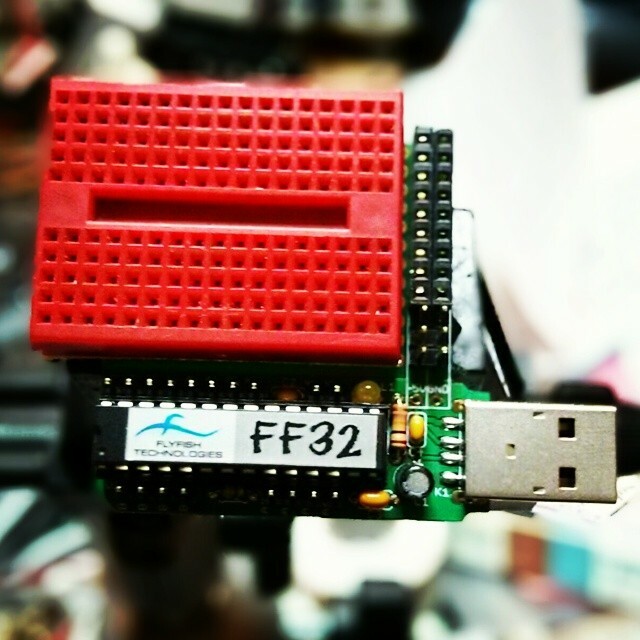 Plug it into any machine (including a Raspberry Pi) and it will be identified as a keyboard. No drivers are required. 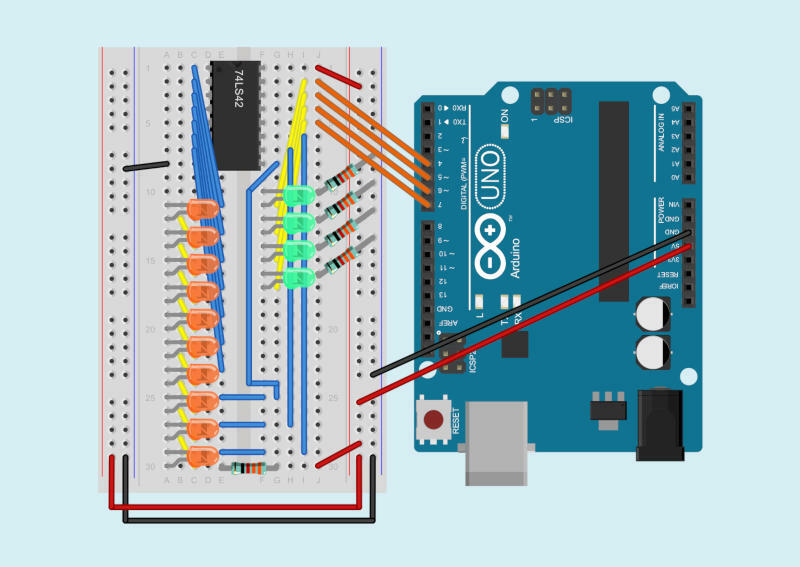 The code is based on the standard Arduino Keypad library basic demo. That code was meant for a different keypad, so I eventually found a configuration that worked in the Sparkfun 12 button keypad datasheet. Rather than printing characters to the serial port, I used calls to Teensy’s USB Keyboard library instead. There’s no reason why this wouldn’t work with those very cheap 4×4 button matrix keypads for Arduino too with only minor modifications. Those keypads use 8 data lines, and they’re arranged (I think) as rows 1-4 on pins 1-4 and columns 1-4 are pins 5-8. The Teensy USB keyboard isn’t limited to sending single characters: a single button press could trigger sending a whole string. I haven’t yet thought out any major uses for this (except “Crypto!”, which is my usual idea when I have no idea what I’m doing), but you might have better plans. 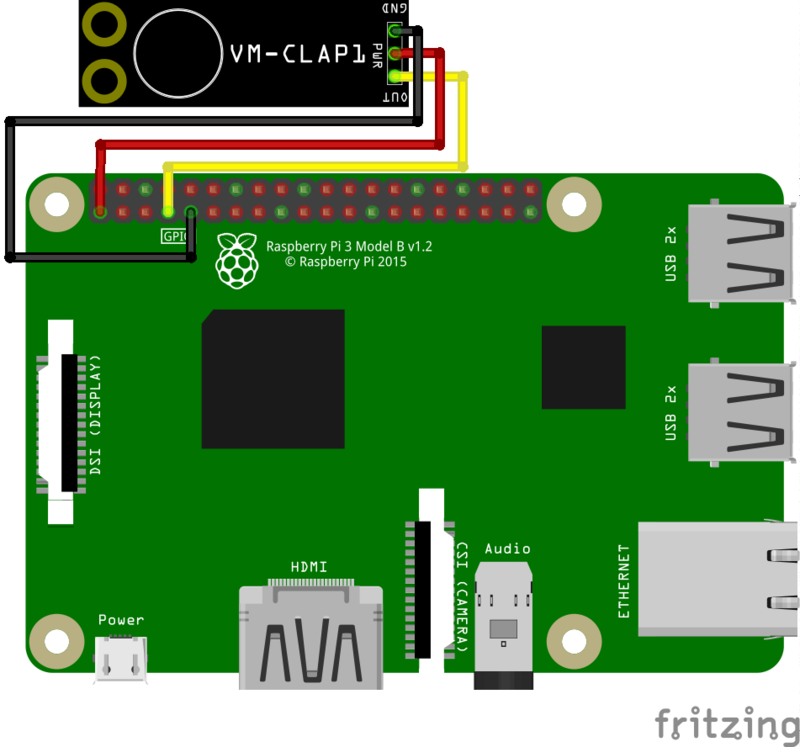 Since the Verbal Machines VM-CLAP1 sensor is an open collector type — that is, it sinks current when triggered — it behaves like a simple button to gpiozero, the Raspberry Pi Python GPIO library. If you attach a callback function to the sensor’s when_pressed event, your Python script will call that function every time it registers a clap. This is a trivial example, but at least it shows that anything you can do with a button, you can also do with this hand-clap sensor. It should work in Breadboard and Schematic mode, but absolutely doesn’t work in PCB mode. 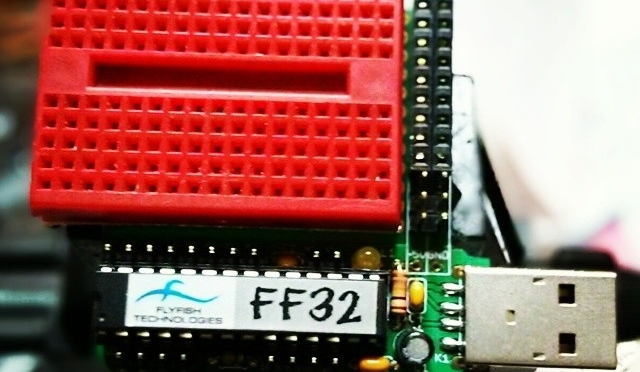 This shouldn’t be a problem, as it’s only available as a standalone board. 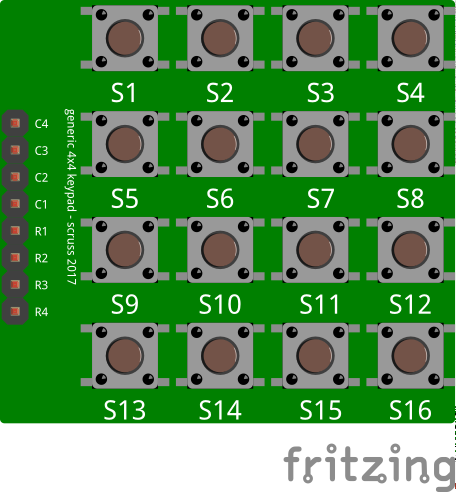 Fritzing doesn’t have any way to create new parts from scratch any more, so I had to base it on a somewhat similar-looking board, the SparkFun Electret Microphone Breakout. 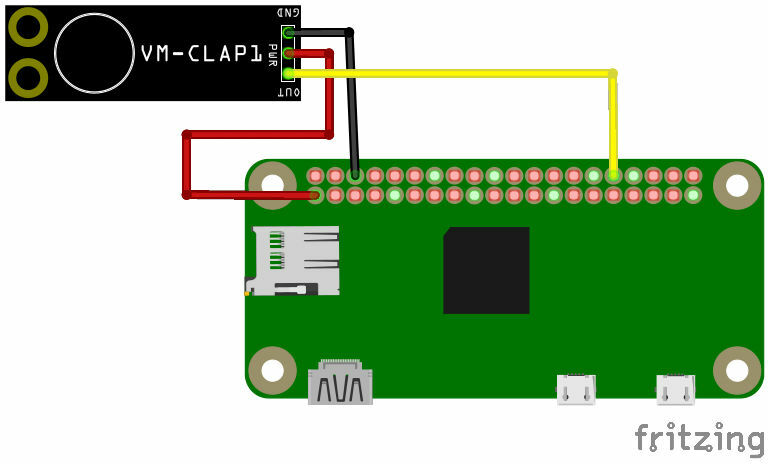 I’m looking forward to see what I can do with gpiozero and the clap sensor. The 7442 only passes inputs from 0 (0000b) to 9 (1001b). All other inputs result in no output. The outputs are really more like 1–10 than 0–9, as a zero input activates the first output. Because the 7442 will only activate one output at a time, it’s okay to use a single current-limiting resistor for all ten output LEDs. The chip also uses active low outputs: the outputs go from high to low when activated. The negative side of each LED goes to an output pin, and the chip sinks current when an output is selected, lighting the LED. 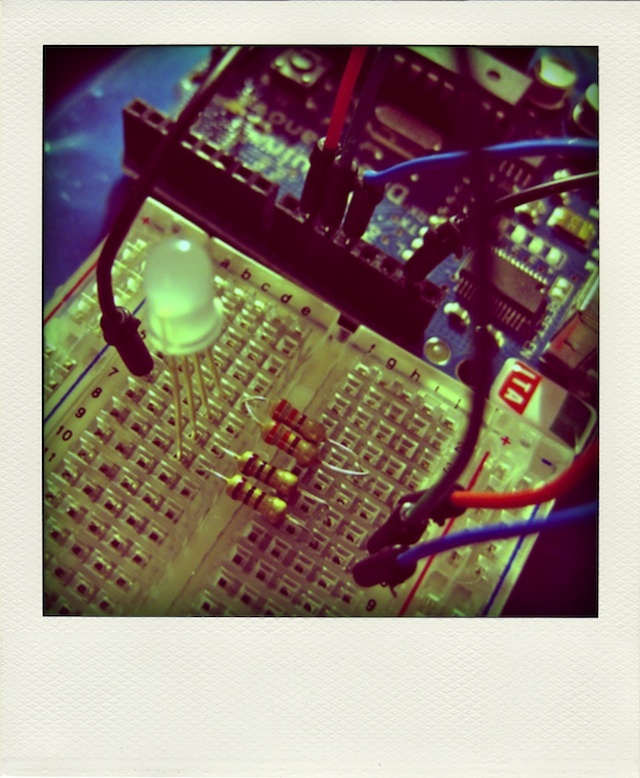 Finally, here’s the Arduino sketch I wrote to drive the chip for the demo video. All it does is cycle through digital outputs 4–7, incrementing a bit every half second. 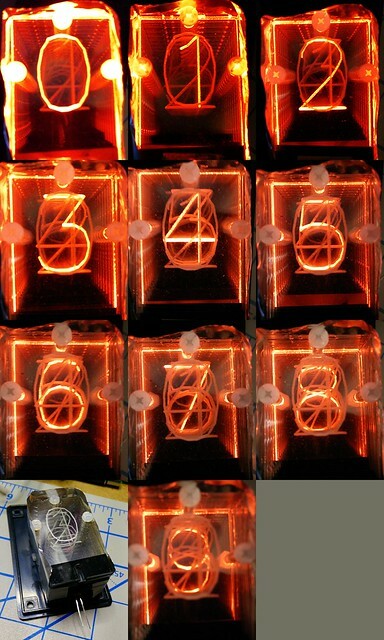 If you felt really fancy, you could drive the LED inputs through PWM, and come up with just the right of flicker to make this look like a Nixie tube. You should also be able to chain the inputs through some shift registers, too. [tɒk bɒks]: inside. The observant amongst you will notice that the speech board is 1/10″ further in than it should be for ideal alignment with the USB serial adapter. Back in the 1980s, the now-defunct Digital Equipment Corporation (“DEC”) sold a hardware speech synthesizer based on Dennis Klatt’s research at MIT. These DECTalk boxes were compact and robust, and — despite not having the greatest speech quality — gave valuable speech, telephone and reading accessibility to many people. Stephen Hawking’s distinctive voice is from a pre-DEC version of the MIT hardware. DEC is long gone, and the licensing of DECTalk has wandered off into mostly software. Much to the annoyance of those in earshot, I’ve always enjoyed dabbling in speech synthesis. DECTalk hardware remains expensive, partly because of demand from electronic music producers (its vocoder-like burr is on countless tracks), but also because there are still many people who rely on it for daily life. I couldn’t justify buying a real DECTalk, but I found this: the Parallax Emic 2 Text-to-Speech Module. 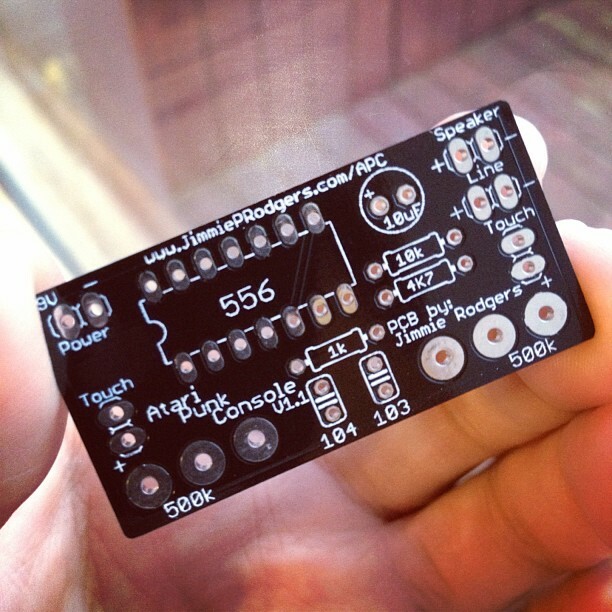 For about $80, this stamp-sized board brings a hardware DECTalk implementation to embedded projects. The Emic 2 is really marketed to microcontroller hobbyists: Make Your Arduino Speak! sorta thing. 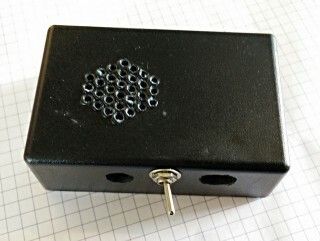 But I wanted to make a DECTalk-ish hardware box, with serial input, a speaker, and switchable headphone/line jack. [tɒk bɒks] (a fair approximation of how I pronounce “Talk Box”) is the result. 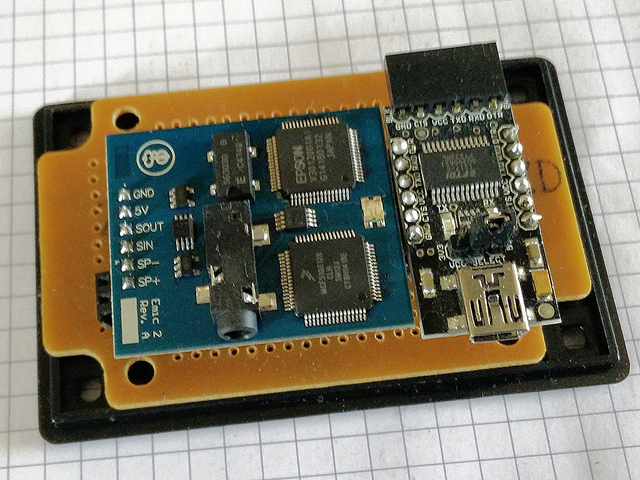 OSEPP FTDI USB-Serial Breakout — there are many USB-Serial boards that would do this, but two points in this one’s favour are: i) it has header pins for breadboard use, and ii) I had a spare one. Small 8Ω speaker element — the one I used is most likely a headphone element, bought from Active Surplus (RIP). This should be as small as you can get away with (and still hear) as the USB-Serial connection isn’t designed to supply audio power. SAll watched over by machines of loving grace. You should hear a voice say the title of Richard Brautigan’s lovely poem All Watched Over by Machines of Loving Grace (caution: video link contains nekkid hippies). You should get the : prompt back once the the speech has stopped. And that’s all there is to it: send an S, followed by up to 1023 bytes of (basically ASCII) text, followed by a newline, and it will be spoken. There’s more detail, of course, in the Emic 2 documentation and the Emic 2 Epson/Fonix DECTalk 501 User’s Guide for changing voices, etc. Yes, you can make it sing. No, you probably shouldn’t, though. The Emic 2 has no serial flow control, so you have to wait until the module stops speaking (or you send it the stop command) before you can send more. The easiest way is to poll the serial port and see if there’s the : prompt waiting. Until you see the prompt, any text you send it may be lost. The Emic 2 is an embedded device; Unicode is a bit of a stretch. It’s supposed to accept ISO Latin-1 8-bit characters (handy for Spanish mode), though. Starting every speech line with S may make this board incompatible with assistive technology software such as the JAWS screen reader. 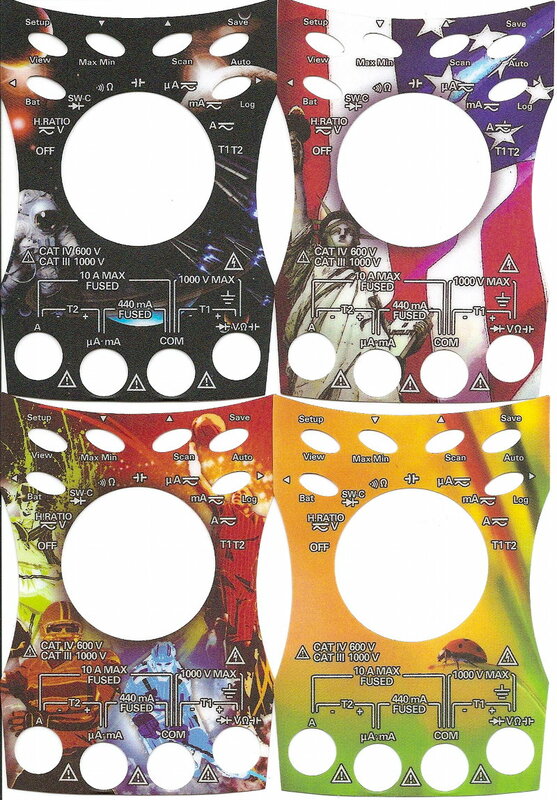 I don’t think that this was the goal for Emic 2’s designers (Grand Idea Studio), however. The output from the audio jack has a fair bit of noise on it, and you need to set the volume quite low to avoid hiss and hum. Your experience may be different, as I may have accidentally made a ground loop. There is a faintly audible click at the start and end of the text, too. The Emic 2 uses DECTalk v5 commands and phonemes. Many DECTalk resources on the web (like these songs) use v4 or older, which are subtly incompatible. I haven’t found a reliable conversion protocol yet. My JYE Tech miniDDS function generator has the fuzzies, alas. It seems that this is a known problem. Newark really need to get a handle on their packaging. See the little orange thing on top? That’s the part. It’s 70×40×15 mm, and made in Malaysia. It was packed bubble wrap in a sturdy little cardboard box (163×73×43 mm, or 12× the volume of the part). 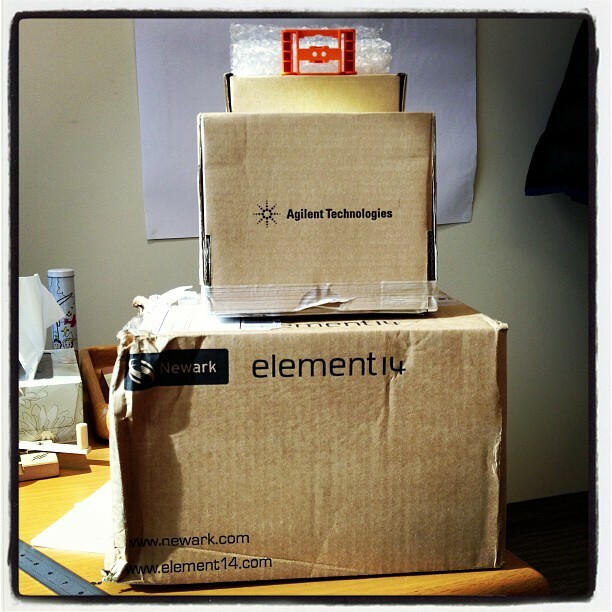 That box was then packed in a very solid box (originally shipped from Penang to Gaffney, SC) measuring 200×200×170 mm; that’s 162x the part’s volume. Finally, that box was inside a third box of 330×245×220 mm, or 424× little doohickeys. Thing is, the little doohickey is a tough injection moulded polymer part. It could probably be dropped in a padded envelope and survive any mail journey. We’re going to die out for sure. 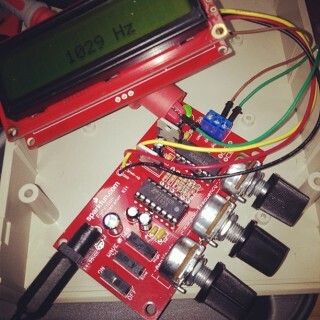 Built a simple Function Generator with Frequency Counter over the last couple of nights. It’s pretty basic — 0-~500kHz, 0-12V, Sine or Triangular waves — but good enough for my test needs. The frequency counter is basically an Arduino repackaged to feed the attached LCD. The counter isn’t super accurate, but is within 1% of what my multimeter says. The kit has a fairly high voltage requirement for DC (>= 15V), but this was solved by a quick trip to Active Surplus. $11 bought me a 15V power supply (which delivers around 19V open circuit) and the right kind of barrel jack. I just built my first Atari Punk Console, a simple LM556-based noisemaker beloved of the circuit-bending crowd (and pretty much avoided by everyone else). Jimmie P Rodgers sells a nice board (or kit), and I bought a few boards a while back, and only just built one up now. … and yes, it really only needs three resistors, three capacitors, and the 556, plus the control pots, power, speaker and all-important on/off button. The APC sounds a little like a drunken, flatulent bee banging around in a lager can, so you really want to be able to turn this thing off. Jimmie designed this to fit in an Altoids tin, but Catherine had discarded a LUSH Massage Bar Tin which looked just about the right size. The tin is made of butter-soft aluminium, so it’s easy to start holes in it with the awl on my Dutch Army knife. It’s bigger than an Altoids tin, so you don’t have to fight to get things in. 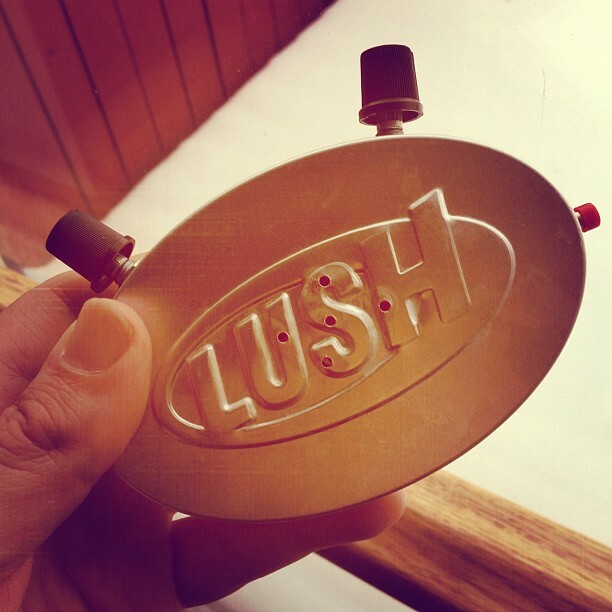 Lastly, the LUSH tin is nicely curved, and fits in your hands well. I’d been surviving on a series of sub-$50 multimeters for years. They’d give an approximation of a reading,then fail miserably in a variety of stupid ways. The last one, a rip-off of an Extech, decided to show me how its wires were connected to the probes. “Barely” is a fair description. So I thought I’d buy a decent meter. One that had heft and gravitas, like the Avo 8 that my dad used to bring home from work. 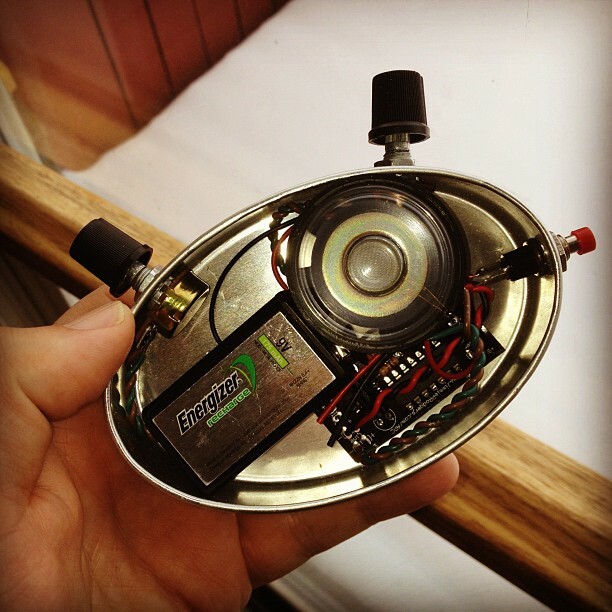 The Avo — seemingly constructed from bakelite, glass and lead — didn’t just take readings, it told you The Truth on its mirrored scale. Dude, what?! Skins on a meter? Meters aren’t toys. Meters are sensible things used by sensible people. We don’t want our work distracted by thoughts of Space!, America!, Sports!, or Some Kind of Bug Thing Eww Squish It Squish It! If you were able to get “skins” for the Avo 8, they would be about Wisden, sheds, and the TSR2. Despite the sticky nonsense, it’s a good meter. I also managed to catch a Handheld Digital Multimeter Cash Back Offer, so it’s cheaper than competing Flukes and Extechs. Pretty much everyone tries the RGB colour cycler when they get their first Arduino. This variant cycles through the HSV colour wheel, though at fixed saturations and values. // H is given on [0, 6]. S and V are given on [0, 1]. GND → LED common cathode. The different resistor values are to provide a limited current to the Triple Output LED RGB – Diffused, as each channel has different requirements. The 165Ω resistor is actually two 330Ω in parallel; I didn’t have the right value, and this was the closest I could make with what I had.